Jakarta, which is the center of government as well as the city center into a large and densely populated metropolitan city. However, behind all the complexities that exist, there are still some places in Jakarta that can be visited for a trip. One of them is Jakarta Chinatown area located in Glodok area. For those of you who do not want to travel far, try to stop by and explore this Jakarta Chinatown. There are many interesting things. Here are some explanations. Surely the existence of this Glodok Chinatown comes from a long historical story. This area has actually existed for a long time and close to the Old City Tour Jakarta. Even before the entry of the Dutch East Indies government in Indonesia. This place is a place for the ethnic Chinese who once had a chance. The Glodok area along with other nearby old villages are along the banks of the Ciliwung River. As a result of these heartbreaking events, the Dutch East Indies government immediately issued an order or regulation in which ethnic Chinese can only live in the Glodok area only. The goal is to monitor them more easily. The rule is called Wijkenstelsel. Not only Jakarta, ethnic Chinese in other areas also apply the same rules. So do not be surprised if in big cities in Indonesia there must be Chinatown area. Chinatown is also synonymous with trading centers. There are many things to do in Glodok Jakarta. 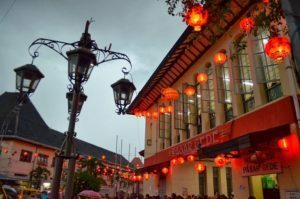 For those of you who want to visit Jakarta Chinatown and wonder what to do there, here are some interesting exciting activities to do. One of the interesting activities that can be done in Chinatown Jakarta is to explore the alias citytour. You can come and walk through every corner of the area. There are many interesting things. In addition, Buddhist and Confucian Chinese will also come there many times to buy their worship equipment. In fact they also often make this location as a place of Lebaran in Jakarta their religion. 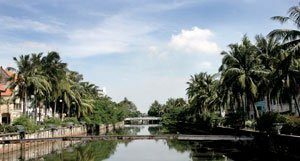 One thing that is interesting things to do in Glodok Jakarta, in Jakarta Chinatown Tour and must do is enjoy a variety of unique and interesting culinary tour. You can hunt for good food in Gloria Gang and the market. But please be careful if the food sold there is not kosher food. Gang Gloria itself is one part of Chinatown Jakarta that sells various types of food. The food there varies, ranging from chinese food, to the local food menu. Please ask the food seller to see if the food is kosher or not. You can also find traditional culinary-culinary in this Jakarta Night Culinary Tour this one. 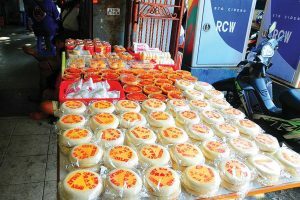 Some interesting culinary is a turtle cake and moon cake. It can also shop for unique decorations in this one place. Besides doing citytour while culinary tour, another interesting thing in Jakarta Chinatown Tour is the existence of old buildings that exist there. Those of you who like old buildings or old building photography can look for the best Photo Spot in Jakarta there. In fact this place is also often used as Prewedding Place in Jakarta. Here are some interesting buildings and spots that can be visited. Also read: Things to Do in Old Town Jakarta Indonesia. The city of Jakarta is indeed in the lowlands. That’s what makes Batavia in the past has a lot of swamps. To overcome this, the Dutch East Indies government made the canals in the city. The purpose of making water canals is to prevent flooding in the rainy season. In addition, the canals are also built for the grooves of small boats in the past. In Chinatown there is one channel that still exists today. his name is De Groot Kanaal or also often referred to as Kalibesar. Formerly this canal is often used as the location of sampan race by ethnic Chinese community. Another old building that is interesting to explore is the Red Shop. This shop is around Kalibesar, which is in Kalibesar Timur V. Toko Merah was built by the Governor General of VOC in 1730 and stood to this day. The governor is Gustaff Baron Van Imhoff. He is one of the figures who disagreed with the Chinese massacre event in Jakarta. The Red House was once the Maritime Academy, in 1743. After that the building was also used as the office of Jacobson Van Den Berg company. Now its function is as the office of PT Dharmaniaga. This temple was built by Luiteneant Tionghioa Guo Xun Guan. When the Chinese massacre took place, this pagoda was also targeted. But then rebuilt. In addition to the temple there is also a church that is there. This church was once the home of a Luitenant der Chinezen. Now this church serves Indonesian and Chinese. That’s all the best things to do in Glodok Jakarta. Such are some explanations from Jakarta Chinatown Tour that need to be known. You can visit Glodok to enjoy this Chinatown tour. Provide enough time loose for your citytour to be more free and free. And for those of you who are Muslims, do not hesitate to ask the food vendors about the halal food that will be purchased for the common good. May be useful.